X-Ray Exact Gold Content in Next to No Time per Item! A gold x-ray machine such as the technologically advanced Bruker S1 TITAN is the state of the art in gold testing. Whether you need a fast, efficient, and highly accurate way to determine gold concentration in scrap gold, gold bullion, or precious gold jewelry, the S1 TITAN gold x-ray machine has you covered. Contact Bruker’s gold analysis experts today to learn how a Bruker x-ray gold machine can boost the efficiency and profitability of your gold business. 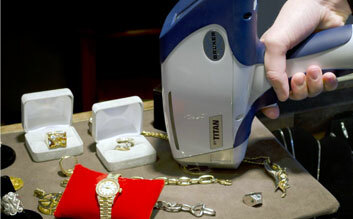 Completely non-destructive-analyze even the most expensive, one-of-a-kind gold jewelry samples without any worry over damage, marks, loss of material, or any other form of damage. Feel free to use the form to your right to quickly find out the detailed features and technical benefits of Bruker’s handheld X-ray machines for gold. Gold x-ray machines work on the principle of x-ray fluorescence (XRF), making them highly accurate and completely nondestructive. X-ray fluorescence gold machines work by exciting the electrons in atoms, causing a change in energy that is unique to each kind of element. That unique energy emitted from an element is then detected by the gold machine, so it can detect the elements in a sample, such as gold, and measure the elements’ quantity by counting the number of unique energies detected. Bruker gold x-ray machines offer gold concentration data from trace levels to 100% in fewer than 5 seconds. Gold x-ray machines from Bruker can ensure that you buy and sell gold based on its true purity, allowing you to get your money’s worth out of every gold sale or purchase and avoid any unnecessary errors. Analyze your refined bullion right on the refinery floor, never pay more for a scrap gold lot than it’s worth, and resolve disputes quickly with a Bruker gold x-ray machine. 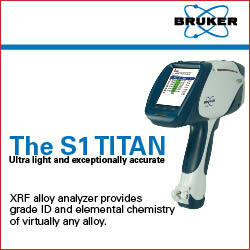 Contact us today to discover how to seamlessly integrate a Bruker S1 TITAN into your business practices!